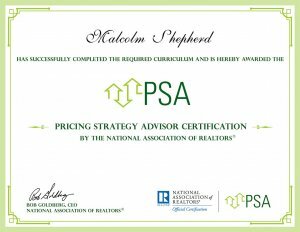 Malcolm Shepherd has earned the nationally recognized Pricing Strategy Advisor Certification. The National Association of REALTORS® offers the PSA certification to a select number of REALTORS® as determining property values depends more than ever on professional expertise and competence, the best use of technology, and a commitment to approach the pricing assignment from various perspectives. “This certification allows Realtor to provide “Consumers with the deserve accurate property value assessments, so NAR is proud to provide REALTORS with a credential that provides enhanced tools, education, and expertise to determine the most accurate value for a home. “Pricing Strategies: Mastering the CMA” is the required for the PSA certification that provides REALTORS® with knowledge and skills to select appropriate comparables and make accurate adjustments, guide sellers and buyers through the details of comparative market analyses and the underlying pricing principles that inform them, and interact effectively with appraisers. Once awarded the certification, REALTORS® will be equipped to guide clients through the anxieties and misperceptions they often have about home values. How does a Pricing Strategy Advisor help you? When you decided to Buy a house or Sell Real Estate, you want to make sure you are getting the proper value. When you decide to sell your house you want to make sure to get the most out of your investment. Also, when you buy you want to make sure you are not over paying and to submit the right offer so it will get accepted buy the seller. Don’t guess. As your certified Pricing Strategy Advisor, I will make sure you are getting the best value when it comes to buying and selling real estate in the Reno Nevada area. For more information and to get started contact me today. Gain the confidence that you are working with the right Real Estate Agent and has a Pricing Strategy Advisor certification when you decided to Buy or Sell in the Reno Nevada area.